A new printing technology called 3D bioprinting promises to revolutionize virtually every aspect of modern life and, perhaps, even transform life itself. 3D printing — sometimes called “additive manufacturing” — has been around for more than 30 years. But now, with the development of new printable plastics, glass and metals, it’s possible to build increasingly more complex parts and products, layer by layer. At CELLINK, staff are developing 3D bioinks that contain human cells. The ultimate mission: to manufacture human organs. More than 100,000 people in the United States need an organ replacement, but there is a critical shortage. The Swedish startup recently opened its U.S. headquarters in Cambridge, near MIT. 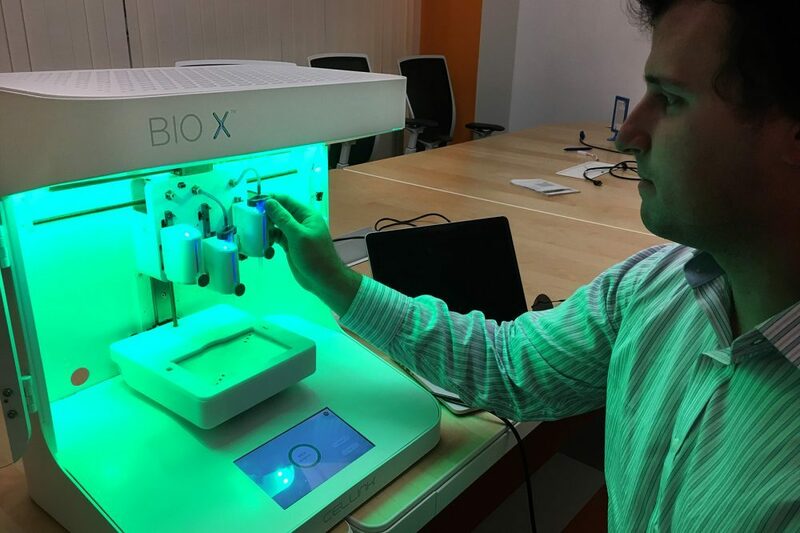 Its bioink chief, Patrick Thayer, demonstrates the BIO X 3D printer and living inks. The BIO X 3D printer looks like a white plastic kitchen coffeemaker, maybe a bit larger. But it’s not brewing cups of joe — but potentially parts of Joe. Where the pot would go in a coffeemaker is a petri dish. Hovering above, guided by software, a narrow nozzle lays down thin layers of bioinks. Once printed, the living inks take on intricate forms using data derived from MRI machines. When finished, the printer glows green, casting an eerie light on Thayer. CEO Erik Gatenholm, a 27-year-old entrepreneur who co-founded the startup two years ago, says his company is in a “super exciting spot.” CELLINK is already doing business in 40 countries and is looking to expand rapidly. It is hiring experts in biomaterials, chemistry, cell biology, software and robotic engineering. CELLINK makes and sells its own models of 3D printers, but Gatenholm says the market and the big money are in the bioinks. Before, CELLINK scientists had to prepare their own living inks.